‘We already had that plan…’ Poe said. Dirk had just explained his master plan of getting more detectives into the real world to find the Writingdesk Conundrum. Poe was balling his fists. I assumed it was time to intervene. ‘It doesn’t matter right now. We can’t wait much longer, all the books we need to be in could be ruined already. I suggest we stop wasting time and we’ll go get us some more detectives. Our first stop couldn’t be anywhere else than A study in Scarlett. We decided on the first Sherlock Holmes book because none of us had found the time to read any of the other books. 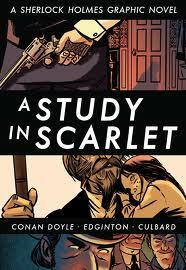 We didn’t dare chance to find a doped up Sherlock down the line of his series. Upon arrival in the book the first thing we found was the apartment at 221B Upper Baker Street in ruins. There was almost nothing left of the building and smoke was still rising up into the sky. ‘Oh my god. We have to see if he was in there.’ I said. Poe ran to the building and started screaming for Holmes and Watson while lifting big chunks of building. ‘That seems unnecessary.’ Dirk strolled over to what was left of the house and just looked at it. He stared at the collapsed apartment some more, scanned the site with squinted eyes and then let out a loud sigh. ‘You’re a detective?’ I suggested. ‘Ceci n’est pas une pipe. If they were dead, we would have found something by now. That’s just the way books work.’ Dirk started studying his nails. We travelled through all the chapters finding nothing but dust and Mormons. Dirk took us to the end of the book, the final chapter, and to find Sherlock Holmes and John Watson. We heard them utter the last few sentences. ‘What happens when the book ends?’ The nearing ending of the book gave me an uncomfortable feeling. ‘Things fade to black.’ Dirk said in a surprisingly sad voice. Dirk was right. Everything was getting darker around us, but no one in the book seemed to notice. I felt like a character in an old film noir movie, where the screen faded to black in the form of a circle from the outside of the screen, invading the scene and erasing the image. ‘I don’t think we should be here when that happens.’ I responded. ‘Who are you?’ Holmes asked me. ‘I do not quite follow.’ Watson confessed. ‘Neither do I, could you please explain to us who this destroyer is?’ Holmes asked me friendly. ‘Saying his name might have been a mistake. You do know detectives just love that kind of thing.’ Dirk whispered. I knew Dirk was just acting aloof. Deep inside he was a big Sherlock fanboy, every detective was. I was planning a smart remark when suddenly the ground started shaking. Buildings behind us were collapsing and the streets were disappearing into thin air. The story was bursting, the Writingdesk Conundrum must be around. Poe and I grabbed our detectives and fled the scene. On entering the library in the mansion, they fell and rolled over the floor, looking clumsy and scared. ‘What.. what just happened?’ Watson exclaimed. Our newfound detectives where looking around, still shaken up from the trip and possible the revelation that they’re fiction. ‘Do you think he will say “Elementary, my dear Watson”? I really want him to! Poe whispered in my ear. ‘Polly! This is no time for a lecture on misquotations. I think you should tell them about what is going on.’ Dirk shoved me to the front. ‘What the hell is going on around here? !’ Behind us a loud and authoritative voice appeared. Poe and I exchanged glances. He had told us that, but we had decided to ignore his arguments. ‘Doing nothing is also dangerous. We had no choice. Now could you do us a favor and please explain to Mr. Holmes and Dr. Watson what is going on around here? We need to get some more detectives.’ Poe tried to look as defiantly as possible while he said this, but I knew he was just as impressed as I was. I took his hand and opened The New York Trilogy on the first page. ‘Don’t leave me here with him!’ Dirk ran at us and took Poe’s hand. ‘Go faster Polly!’ Poe hissed at me. The case seems simple enough. White wants Blue to follow a man named Black and to keep an eye on him for as long as necessary. ‘Where are we? What book is this?’ The surroundings were getting a little lighter as Dirk spoke. Poe and Dirk both looked surprised. ‘I’m intrigued. Let’s go get him!’ Dirk turned to Blue’s apartment with a fervent step. We couldn’t do anything else but follow.